Colbert will have to wait to have a treadmill named after him launched into space. Stephen Colbert will have to wait for bragging rights in space. 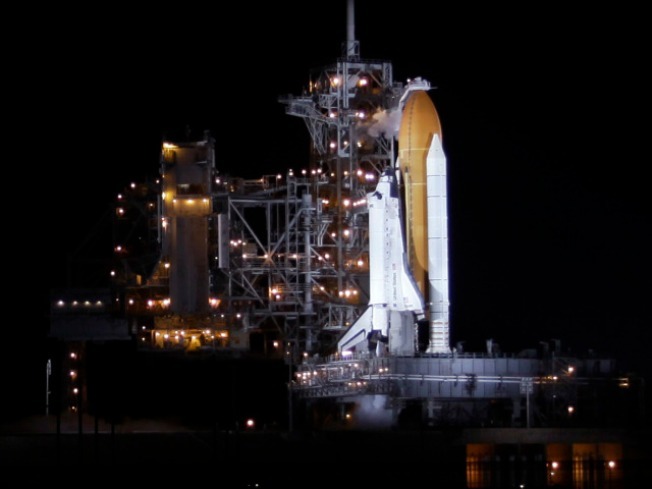 Thunderstorms forced NASA to call off the launch of space shuttle Discovery early Tuesday. The shuttle is set to carry seven astronauts to the international space station, along with a treadmill that bears comedian Colbert's name and 17,000 pounds of gear. In a pre-recorded message, Colbert said he was proud the treadmill would "help finally slim down all those chubby astronauts," The Associated Press reported. Colbert initially won an online contest to have a room named for him in the space station but NASA balked. Instead, the agency named a new $5 million treadmill "Combined Operational Load Bearing External Resistance Treadmill" or "COLBERT." NASA will try to launch again on Wednesday.